Andra Dalrymple wanted to save the world by her 16th birthday. After she succumbed to sudden cardiac death at age 12, Andra’s family made a plan to bring her dream to fruition one heart at a time through the Andra Heart Foundation. Sunday was her 20th birthday, and the nonprofit is well on its way to fulfilling that dream for the young girl who loved school, sports, pandas and the outdoors. “It is always difficult to lose a child, but I love the opportunity to continue to keep Andra in all of our minds in a positive way and to keep loving the things that she loved,” said Jenine Dalrymple, Andra’s mother and founder of the nonprofit that supports education and screenings for sudden cardiac death. To date, the foundation has screened more than 4,250 students for hidden heart conditions with electrocardiograms; students who have had abnormal results can receive support for a free initial follow-up with a cardiologist. Education programs include free public lectures on sudden cardiac death; awareness campaigns encourage teen athletes and their parents to recognize possible symptoms of undiagnosed heart conditions (chest pain as well as dizziness and/or passing out during exercise) and to know their family history since many conditions that cause sudden cardiac death run in families. The foundation also offers education and training in CPR; provides Automatic Electronic Defibrillators to schools, recreation facilities and families; and supports stipends for student activities. 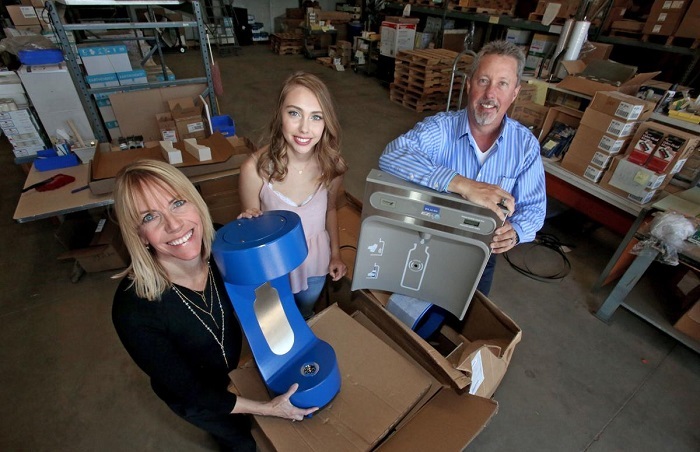 Additionally, it has initiated a water project that has installed water bottle filling stations in Flowing Wells School District — where Andra was a student — and will provided 8,000 water bottles to students by the end of the year. “Water is key for heart health. That fact is kind of a sleeper, but in Arizona many cardiac conditions look like dehydration. At one point we thought my younger daughter, Grace, was having a cardiac event and she was actually dehydrated,” Jenine said. She emphasized that the Centers for Disease Control have found that access to safe, free drinking water helps to increase overall water consumption, maintain hydration and may improve cognitive function in children and adolescents. The American Academy of Pediatrics also recommends that children be taught to drink water routinely as an initial beverage choice and that they have free access to water, particularly during school hours. “It is so hot here and kids need water, but one of the gals who helps our foundation commented that you have to market water to kids because of Gatorade and other sports drinks and soft drinks. That was my ‘Aha! moment.’ When kids are in school they can’t always get a drink whenever they want ... they can go all day without drinking and get dehydrated, and we want to help prevent that,” said Jenine, who plans to expand the water project to other local schools and public spaces. To facilitate that expansion, fund lectures and support other foundation projects, volunteers will stage the Third Annual Andra Heart Foundation Movie Night with a viewing of “Wait Until Dark” on Friday, July 13, at the Fox Tucson Theatre, 17 W. Congress St.
Jenine said the summer fundraiser also serves as a celebration of “Andra Heart Day” — Andra’s birthday, which is July 1. “She used to say that everyone has special birthdays — her Jewish friends were having bat mitzvahs and her Spanish friends would have quinceañeras — and she asked, ‘What do I get?’ I laughed and she said, ‘If I save the world by my 16th birthday, can I have a big party?’ So we had a huge party on her 16th birthday at the Children’s Museum Tucson and the movie night grew out of that,” said Jenine. In Andra’s honor, the movie nights have featured Audrey Hepburn films. “Andra just loved Audrey Hepburn; she read her biographies and saw all of her movies. The first year we showed ‘Roman Holiday;’ last year was ‘Funny Face’ and this year, since it is Friday the 13th, we are going with the spooky thriller, ‘Wait Until Dark.’ And the Fox is just such a great place to see a movie,” said Jenine. Jenine said that the fundraiser is a low-key, fun way to spend a Friday night. “I go to lots of charity events and there is no hard sell here. We watch the movie and eat snacks and tell you about the foundation. It is a great opportunity to show an awesome movie in Tucson, raise some money and do something fun to remember our kid in a happy way,” she said.